Almost 20% of the world’s population have some form of disability or impairment that impacts their use of digital products. Yet Digital Accessibility is often a misunderstood concept. It isn’t just a way of organisations protecting themselves from being sued by coding their websites according to a standards tick-list so they work with screen-readers. It’s about working to ensure your website, intranet, widget, workplace application, mobile site, mobile app, or IPTV app is able to be used by as many people in its target audiences as possible. It’s about recognising that no product is ever going to be usable to all users, and finding a reasonable, justifiable way of balancing the resource costs of inclusion against the benefits. And it’s about letting your users know when you’ve not been able to fully support their needs. Fundamentally, it’s about understanding the challenges of inclusion, and solving them in creative ways, to gain a bigger audience so your product is more successful. In this book Professor Jonathan Hassell, award-winning international thought-leader in digital inclusion and lead-author of the BS 8878 British Standard on Web Accessibility, will take you on a journey to transform your organisation to achieve the consistent creation of web products that are usable and accessible to all your customers, at the most efficient cost. BS 8878 is not a declaration that the finished web product has met a standard. It’s a statement that the process of developing the product has followed a standard where educated decisions about accessibility have been made. Through this process web managers and developers will gain a deeper and broader understanding of web access issues that will bring both short-term and long-term benefits to the community as a whole. This focus on following a set of processes is helping to move institutional practices on from use of the WAI model, in which the emphasis has tended to be on ensuring that Web resources conform with WCAG guidelines. For me the next step should be exploring how the higher education sector can make use of BS 8878 in enhancing the accessibility of online teaching and learning and research services. If you’ve an interest in this area feel free to get in touch. If you’d like to know more about the book visit the Amazon or BSI web site. This entry was posted on 17 Nov 2014 at 10:00 am	and is filed under Accessibility. You can follow any responses to this entry through the RSS 2.0 feed. You can leave a response, or trackback from your own site. 1. It’s only available as a paper copy. How? Why? 2. It’s outrageously expensive. Thus reinforcing the message that accessibility means additional expense. 3. It’s text and text and text and text. Just browsing it on Amazon, the only accessibility feature it has is that the text is left aligned. There are a few bulletted lists and a few graphs but no flow charts, no summaries, relatively few section headings. How about an accompanying video? How about a podcast with an interview? So many possibilities to demonstrate good practice. What we get instead is a long passage in italics eschewing so many other graphical ways of indicating quotations. That’s not a criticism of the book’s content which (from what I’m able to glean from a quick perusal – and knowing many of the points) is spot on. But a cry of frustration with the lack of dogfooding in the accessibility community. If we can’t get it right, how can we ask the rest of the world? Thanks for your comments about the format of my book. 1) The tagged PDF version of the book will be available from the BSI shop within a couple of days. Thanks Jonathan, I couldn’t find any more information anywhere. There’s no link to info about the book on the website. You address most of my concerns. I’d still like to see an ePub version and perhaps a different publisher. Like Bloomsbury Publishing who are willing to publish books under an open license such as this one on Digital Scholarship http://www.bloomsbury.com/uk/the-digital-scholar-9781849666268. At this price, the book is out of reach of most individuals or small organisations who cannot get it through library subscriptions. Accessibility is more than just about formatting. I think you’ve raised a very interesting issue: should a book about web accessibility be itself universally accessible, which might include issues such as file formats and affordability. I would first say that I don’t believe in “universal accessibility” – I think accessibility is a journey, not a destination. 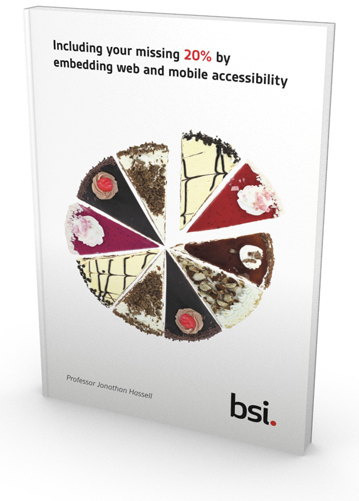 I would also point out that BS 8878 is about pragmatic approaches to enhancing accessibility which includes choosing the delivery platform to support; choosing the target browsers, operating systems & assistive technologies to support and choosing whether to create or procure the Web product and, once those decisions have been made communicating the Web product’s accessibility decisions at launch. When writing a book there will be factors such as copyright and publishers’ policies – which will include setting a price for the publication. These are factors over which an author will probably have little control. However there may be additional approaches which can be taken – and in this case Jonathan has produced a series of video interviews which will be published shortly and which will provide additional insights into web accessibility using another medium (declaration of interest – one of the video interviews is with me). I suspect that accessibility researchers, such as you and me, will have encountered similar real world constraints on the accessibility of our peer-reviewed papers: they will typically be written in a scholarly style, which is not necessarily always readable and we will be constrained by the file formats and design of the publishers’ templates. I completely agree with you that “accessibility is more than just about formatting” – it’s also about working within the constraints provided in the real world.